I've seen the original Teenage Mutant Ninja Turtles movie about 1,000 times. My mom dubbed it on VHS off of cable, and for awhile my younger brother had to watch it like every day. I didn't mind, it's a cool movie and I dug the turtles too. 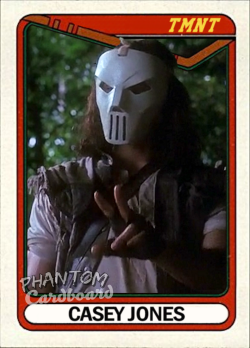 In some respects Casey Jones (played by Elias Koteas) stole the show, Casey Jones is just such a cool character. Sticking with my penchants for matching custom trading cards to the year of the subject, the old school hockey goalie mask wearing Casey Jones got plugged into a 1990 Topps hockey inspired template. Despite being a citizen of "Hockey Town" I've never been a huge hockey guy. Hockey takes money to play and we didn't have a lot of that growing up (hence my love for basketball). 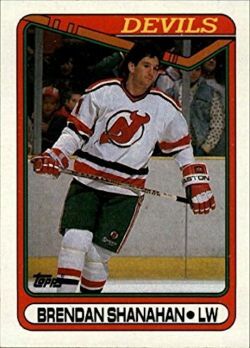 But, I love the look of most older hockey card designs; most have a great vintage feel to them. Love the way this turned out and I was glad to add another hockey character to the PCb catalog.